Kent, and attended Bangor Theological Seminary. served on three departments leaving the field as Captain of the Police Bureau at the Medical College in Augusta, GA. He owned and operated a small restaurant in Veazie, ME for five years. The menu featured comfort food freshly prepared with a side order of conversation. In 1981 Mark answered the call to ordained pastoral ministry. He served two part-time churches while in school, and served a twenty-six year pastorate in Portland ME. He now serves as the part-time pastor in Carmel,ME. Master. 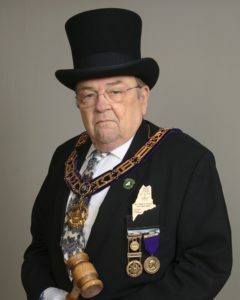 He was elected and installed Grand Master of Masons in Maine in 2018.
several years and served as the Chair of the Board of Regents until his election as Deputy Grand Master. He is a Past Master of Seminary Hill Daylight Lodge in Bangor, ME. While living in Georgia, Mark met and married his lovely wife LaVerne. They have four children and numerous grandchildren and great grandchildren.